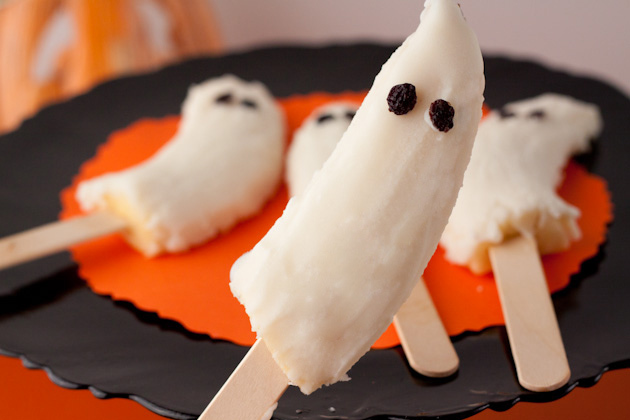 Playful frozen ghost pops made with banana, coconut butter, and dried currants! Cut banana in half lengthwise, then in half to make four quarters. 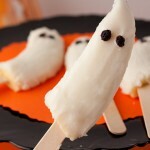 Insert a popsicle stick in each quarter and place on a parchment paper lined baking sheet. Place the baking sheet in the freezer until the banana is frozen – this took about an hour or so. When you’re ready to top the ghosts, place coconut butter in a microwave safe mug and microwave for 1 minute on power level 5. Stir every 20 seconds to make sure it doesn’t burn. Alternatively, place the coconut butter in a mason jar and allow to sit in a bath of boiling water for 2-3 minutes. Scoop about half a tablespoon of coconut butter on your finger and spread over the top of the banana, don’t worry about the backside. Try to cover the banana as quick as possible! The coconut butter will set very fast. Take another half a tablespoon and spread over the remainder of the ghost. I tried spreading the coconut butter with a spoon on a couple of them and it just didn’t work out that well. Dab a bit of coconut butter on the currants and set for the eyes. Repeat steps 5 and 6 for the remaining bananas before returning the baking sheet to the freezer for another 30 minutes.